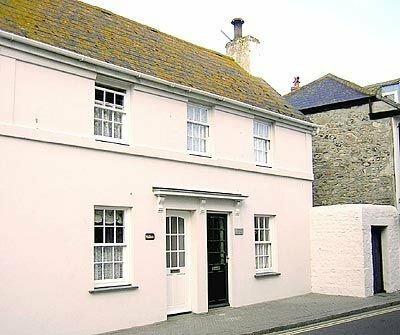 These two delightful cottages are only 60 yards from sandy beaches and both enjoy some sea views over Mount’s Bay. Forming an adjoining pair, they stand on the main street of the ancient, silk-trading town of Marazion. Both holiday cottages enjoy their own south-facing garden and patio with garden furniture. In the bay, rising out of the sea and topped by its magnificent castle, is St Michael’s Mount (NT) – reached on foot at low tide, otherwise by ferry. There are shops, pubs, restaurants, sailing and windsurfing within yards, and nearby are cliff-top walks and excellent bird-watching on Marazion Marshes. Penzance (3 miles) is a relaxed town with many amenities and boat trips to the Isles of Scilly. Riding, golf and sea-fishing nearby. Shops 200 yards. Several pubs locally.Entrance into living room with open fire set in antique fire-surround . Open-plan, oak-fitted kitchen with dining area and door to garden. First floor: Three bedrooms; one double with sloping ceiling, and two single with partial sea views. Small bathroom with over-bath shower and toilet. Be the first one to tell us about your rental experience while staying at Mount Cottages - Pepper Cottage. Let us know if the listing matched your expectations. You can share your comments about the location, property owner/manager and all the unique features that made your stay a memorable one.